If you own a car in New York, you know that parking can be a downright nightmare. Finding a spot is like hunting for a needle in a haystack, and when you do find one, it’s hard not to approach it with trepidation: Why is this spot empty? 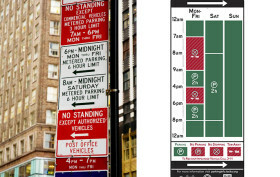 New York City parking signs typically run the gamut of perplexing to misleading at best, requiring a Rosetta Stone and a prayer to keep a parking ticket from happening. But there’s a beacon of hope shooting through all of that confusion in the form of well-designed signage.